Welcome to motherhood! After the initial sweet newborn days, you might be wondering (and Googling) if life will ever go back to normal. Life as a new mom can be overwhelming, and it’s easy to get caught up in it all. Many moms find that they’re spending a lot of money as they try to adjust to their new family life. 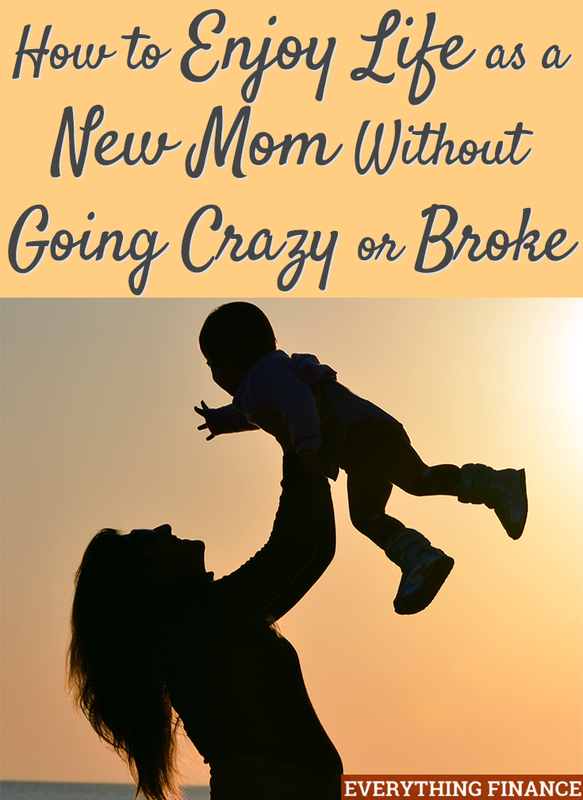 Here are a few ways to enjoy your life as a new mom without going crazy or broke. Dealing with sleepless nights on top of many more new mom issues is stressful. I’ve found that I deal with my mom stress by eating all things chocolate and with online retail therapy. Obviously both reactions to stress are hard on the wallet. I have currently started trying to deal with my stress by working out, taking a nap (when that’s possible), and reading. I can tell you when I handle my stress in a healthier way, I feel so much saner. I love buying used clothing for both of my daughters. They usually wear cute items, or at least average baby clothes. Unfortunately, I’ve made the mistake of looking up other mom’s profiles on social media only to see their babies dressed to the nines. The temptation and pressure to dress my baby in the best, dress myself in the best, or use the best baby gear is all around draining. It’s hard to turn down the temptation to buy sometimes, but in the end, “stuff” doesn’t matter. You’ll only remember the sweet memories with your children, not how good you felt having the expensive stroller every other mommy at the park had. Another area many new parents waste money on is fast food. As a new mom, you spend all day caring for your baby and perhaps other children. Then five o’clock rolls around, and you realize you have nothing easy to prepare for dinner (or the energy to make dinner). Save yourself time, money, and stress, and streamline your dinner process. I have done freezer meal plans and 5 Dinners in 1 Hour plans. I love both. When I did the freezer meals, I found about 7-10 freezer meals I wanted to try, and then made 2-3 of them. This gave me a huge stockpile of dinners in my freezer. The process of shopping and preparing all of the meals took an entire day, but then I didn’t have to worry about dinner for the next 3-4 weeks. Also, my kitchen stayed cleaner as a result. Right now, I’m using 5 Dinners in 1 Hour (link is to a full review) to save even more time and money. You can pick from four plans, and all you have to do is print out the grocery list and follow the prep steps to make five dinners in one hour. One week, I did the grocery shopping and meal prep in about 2.5 hours, and this was with two kids. I’m sure if I didn’t have to do lunchtime or nap time, it might have been even quicker. New moms or seasoned moms, what are your favorite tips for staying sane and saving money? Great tips! I used the GoodCheapEats.com meal plans, and loved them. Consider checking her out.